I'll admit it, I stared. I was in the Collins Hill wrestling room as my six-year-old son had just finished his first-ever wrestling practice. The younger group of kids was finished for the night and the older kids were now wandering into the room. Some of these 11-14 year-olds were stretching, getting ready for practice, others were goofing around with their buddies, some fidgeted with the weight-lifting equipment, and one crawled on "all-fours" right past my son and I.
I should've told my son not to stare, but I too was doing exactly that. You see, Kyle Maynard, then just 12 years old, was in the room. After processing the whole scene in my head for a few seconds, I reached the conclusion that Kyle was there merely to support his friends, to try be "one of the guys". "Poor kid" I thought. Like so many others before and after that night, my conclusions about the boy with no arms or legs were wrong. Blatantly wrong. Kyle was there to compete. Kyle was not to be pitied. Kyle was to be admired. 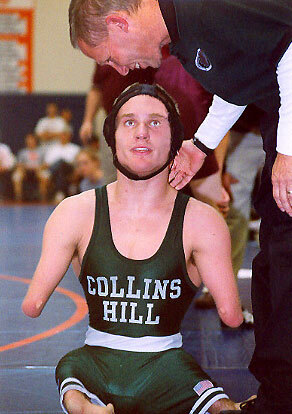 Over the next 6 years, those of us close to the Collins Hill Wrestling program were blessed to witness first-hand the incredible story of Kyle Maynard. We watched him lose...a lot. Then suddenly, it seemed, Kyle started winning...a lot. The lessons Kyle taught us and, more importantly, taught our children are too many to detail, but suffice to say, we are all better off for having shared in what I would have thought to be miraculous on that first night in the Collins Hill wrestling room. His story is well documented now. 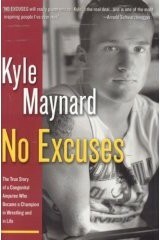 A multitude of television appearances, awards, speaking engagements, and Kyle's biography, "No Excuses", have made Kyle famous. This season we are honored and excited to have Kyle as a volunteer assitant on the CHHS coaching staff where he is sure to be an inspiration to a new generation of Wrestling Eagles. The Collins Hill Wrestling Family is honored to dedicate this page as a tribute to someone that has meant so much to so many.